“I am constantly impressed by the quality of research I see coming out of Scotland’s higher education and research centres, and today’s fascinating tour shed light on the continuous innovation at the James Hutton Institute"
Mr Richard Lochhead MSP, the Scottish Government’s Minister for Further Education, Higher Education and Science, today visited the James Hutton Institute in Invergowrie to hear about world leading research in land, crop, waters and the environment. During his visit, Mr Lochhead was briefed about the progress of the International Barley Hub and the Advanced Plant Growth Centre initiatives, since the announcement of their inclusion in the Tay Cities Deal. As part of this discussion, Mr Lochhead was given a tour of the vertical farm built by Scottish agribusiness Intelligent Growth Solutions at the Institute’s Dundee site, the first facility of its type in Scotland. Mr Lochhead met with Professor Colin Campbell, Chief Executive; Professor Lesley Torrance, Director of Science; Professor Derek Stewart, agri-food business lead; and Dr Craig Simpson, senior postdoctoral scientist and Head of the Postgraduate School and Professor Paul Birch, Head of the Division of Plant Sciences of the University of Dundee. 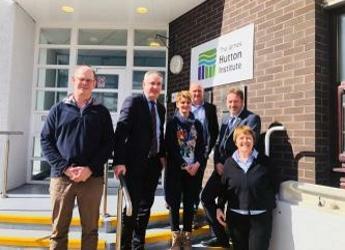 The Minister was also introduced to the Institute’s Postgraduate School and had the opportunity to meet with postgraduate student Aurélia Bézanger, winner of the Chief Executive Prize at the recent Hutton Postgraduate Student Event, and had the opportunity to discuss the close partnership between the James Hutton Institute and the University of Dundee. At the end of the visit, Mr Lochhead said: “I am constantly impressed by the quality of research I see coming out of Scotland’s higher education and research centres, and today’s fascinating tour shed light on the continuous innovation at the James Hutton Institute.